The great taste and texture you expect from Jelly Belly - made with all-natural flavors and colors! 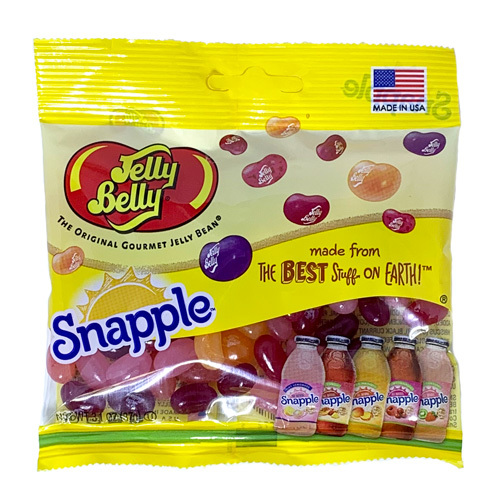 Jelly Belly Snapple Mix includes five exciting flavors bursting with fresh fruit taste: Fruit Punch, Kiwi Strawberry, Mango Madness, Cranberry Raspberry, and Pink Lemonade. All the beans are made with real fruit juices and purees. Ingredients: Sugar, corn syrup, modified food starch, contains 2% or less of the following: cranberry puree, raspberry puree, grape juice concentrate, mango juice concentrate, strawberry juice concentrate, kiwi juice concentrate, lemon puree, cherry juice concentrate, cranberry juice concentrate, natural flavors, citric acid, color added, grape juice extract (color), tumeric (color), apple (color), purple carrot (color), hibiscus (color), black carrot (color), black currant (color), carrot (color), confectioner's glaze, beeswax, carnauba wax. Additional information from the manufacturer: From the package: "Made in a PEANUT FREE factory"
Misc. Info: Manufacturer claims this product is non-GMO. Each 3.1oz (87g) bag contains approximately 70 jelly beans. My son absolutely loved the flavor of the Snapple Jelly Belly Jelly Beans. I would buy them over again!! !